3-Piece Strip & Test Kit.Strips 8-16 AWG solid wire and 10-18 AWG stranded wire. Automatically detects low and standard voltage. Troubleshoot 120 VAC grounded outlets. High intensity, bright green or blue LED indicates the tester is operational and aids in illuminating the workspace. Klein Tools RT100 is a receptacle tester designed to detect the most common wiring problems in standard receptacles. Klein products, manufactured and sold for commercial or industrial uses, are warranted to be free from defects in materials and workmanship for the normal life of the product. 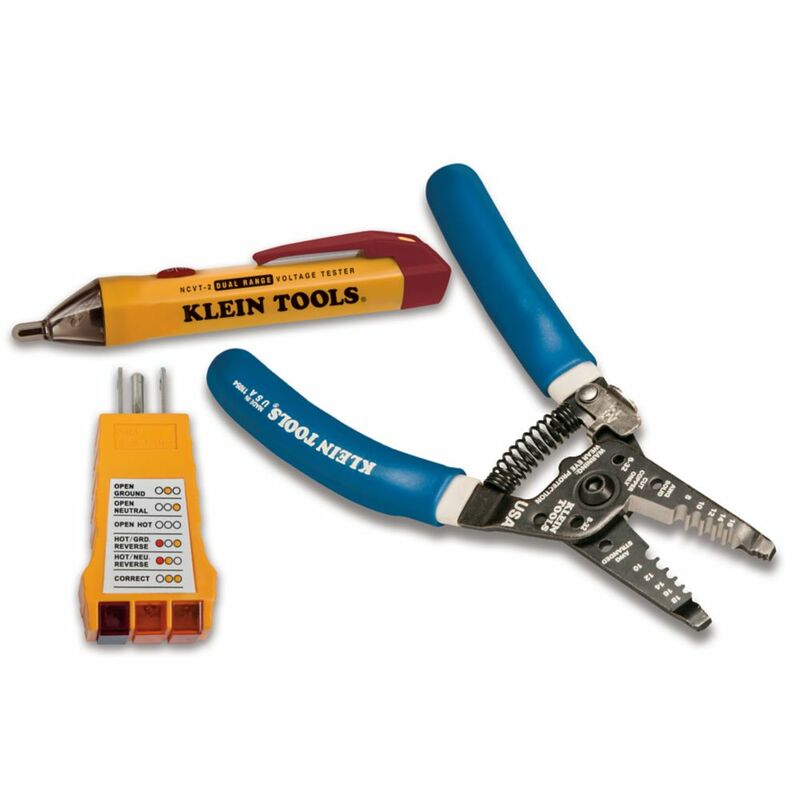 The Klein Tools Dual-Cartridge Radial Stripper is ideal for high-volume, multiple-type cable preparation environments. Cartridges snap in from both sides for left- or right-handed operation. Durable high-carbon steel cartridge cutting blades are ground and honed for long life. Klein Tools Clamp Meter Kit includes the CL110 400A Auto-Ranging Digital Clamp Meter, RT210 GFCI Receptacle Tester and 69409 Line Splitter 10x. The kit allows for easy testing of live circuits and measuring of voltage. The kit includes a carrying pouch, test leads and batteries. 3-Piece Tester/Wire Stripper Set 3-Piece Strip & Test Kit.Strips 8-16 AWG solid wire and 10-18 AWG stranded wire. Automatically detects low and standard voltage. Troubleshoot 120 VAC grounded outlets. 3 Piece Tester/Wire Stripper Set is rated 4.5 out of 5 by 2.